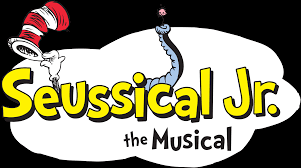 Auditions open for upcoming production of Suessical, jr.
OLF elementary students in the 2nd to 6th grade may audition for the upcoming school performance of Suessical, jr. to be held at Lynn Meadows Discovery Center on March 30th and 31st. Auditions will be held on Wednesday, January 11th from 3:00 to 4:30 pm. Students interested in auditioning for a feature role should learn one of the songs from the show. The songs along with more information about the performance may be found on our home page under Getting Started. If you are interested in a chorus role than any song may be sung at the auditions, but please be prepared to sing a short song either with or without accompaniment (a CD player and mp3 player will be available for use at auditions). There will be a pre-show performance opportunity for kindergarten and 1st Grade students with no audition – information regarding this will be will be released in February.